What will be the future for Converse Chuck Taylor All Stars? For more than half a century, Chuck Taylor All-Star sneakers — canvas, with a trademark star logo — ruled every schoolyard, high school, college and pro basketball court in America. But Converse Inc., the company that invented basketball shoes, continues to struggle under a full-court press of problems. Since January, the company has sought bankruptcy protection, closed three North American factories and moved production to Asia, and then was sold at auction for $117.5 million to cover debts. Chuck Taylors, once worn by 70 to 80 percent of hoops players, are now more often seen on counterculture teenagers and Baby Boomers. Converse’s basketball shoes, meanwhile, account for about only 2 percent of athletic footwear sales. New chief executive Jack Boys says the company won’t be able to turn back the clock to the glory days, but he says there’s room for Converse in a world dominated by Nike Inc. and Reebok International Inc. The task falls on a new Converse, whose 180 employees are a far cry from the 2,000-plus just two years ago. The company feels more like a startup than a 93-year-old brand, Boys says, and in a way it is: its new owners bought only the valuable Converse brand and none of the old company’s debts. Investors Marsden Cason and William Simon, through their company Footwear Acquisition, saw an opportunity in the Converse name. Cason and Simon have had problems of their own in recent years. They ran Odyssey Holdings, former parent company of The North Face, when it went bankrupt in 1993. In 1996 the pair took The North Face public, but in 1999 that company had to revise overstated earnings for two quarters in late 1997 and early 1998, during which time Cason was chairman and Simon the chief executive. The North Face’s stock plummeted and investors responded with a class-action lawsuit that was later settled. 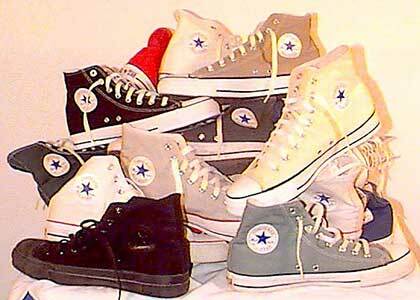 Experts agree that the Converse name is still well-known. It’s just a question of whether the new company can make the products to back it up. The old Converse was a victim of self-inflicted wounds and large-scale industry changes, experts say. Its rubber-toed shoes started fading in the 1970s, and by the 1980s athletic shoes were turning into small machines packed with pumps and gases and gels. Converse couldn’t keep up with the new technologies or the marketing dollars behind them. Then there were internal factors, among them a disastrous acquisition of apparel maker ApexOne in 1995 that strangled Converse in debt. But there was also bad luck. Nike signed Michael Jordan, whose court skills and appealing image brought the company fame and fortune. Converse signed Latrell Sprewell, who had to be dropped after he tried to choke his coach. Last year, sales were just $145 million, and by the time it declared bankruptcy in January, the company had lost more than $100 million. The big question, Doyle and other analysts say, is whether Converse will go “down market” and try to sell itself as a cheaper, second-tier shoe. No way, Boys says. “Performance has always been the heart of this brand,” he said. Though some pro athletes still wear Converse shoes, the company isn’t currently paying anyone to wear them. Boys says Converse may look for superstar athletes to sign, but may decide it doesn’t need to.